Dwarf hairgrass (Eleocharis parvula) is one of the best aquarium plants, if you need to create a ‘real lawn’ in a tank. This is a representative of coastal-aquatic vegetation, which natural habitat spreads all over the world and this fact consequently shows that the plant is easy to keep. Due to its ability to cover the substrate surface with thick green carpet, Dwarf hairgrass is more often used in the foreground of a tank, which helps to imitate thick green lawns or grassplots. Eleocharis parvula is a plant from circumboreal region: it is encountered in Eurasia and from North America up to Central America. Also you can find it in North Africa (Egypt) and South America (Cuba, Guatemala, Nicaragua, Venezuela). The plant grows in brackish waters, bogs and in humid alkaline soils. It easily and quickly adapts to new growing conditions and habitats. Eleocharis parvula is a Latin name of the plant, but it is usually called dwarf hairgrass or hairgrass. Provided with optimal conditions it won’t grow taller than 5 cm (2 inches), though at low level of illumination it can grow up to 10 cm long or more. The plant leaves are thin and straight, their shape resembles needles. The plant height highly depends on the level of illumination: the more light the plant gets, the lower its bushes are. It has rather high growth rate; hairgrass propagates by means of branch-shoots and can rather quickly cover the selected area. You should keep in mind, that Dwarf hairgrass has several variations. The current article is about Eleocharis parvula. However, recently another species Eleocharis sp. mini has appeared, which is quite a seldom one for now, but it is quickly gaining popularity. Requirements for keeping these species are identical, the difference is that Eleocharis sp. mini is smaller than Eleocharis parvula and it has twirled leaves, while Eleocharis parvula has straight leaves. Another thing is, that Eleocharis sp. mini grows very slowly. This plant is not for beginners, though it is not a challenging one for experienced aquarists to keep. It takes a long time for Dwarf hairgrass to strike roots after it was planted. That’s why, if it is possible, you shouldn’t use this plant at the stage of setting up an aquarium. Provided with favorable conditions Eleocharis parvula grows rather quickly and easily forms a thick green lawn, which stands trimming quite well. Trimming the plant from time to time promotes appearance of new shoots and helps making the lawn thicker. To ensure Eleocharis parvula stable growth rate it is recommended to supply СО2 and add fertilizers into the tank. In general, this is rather undemanding and very beautiful aquarium plant in case of a settled tank. Shallow tanks with large bottom square are good to cultivate Dwarf hairgrass, since in tall ones the plant slows down its growth rate or even stops growing at all. 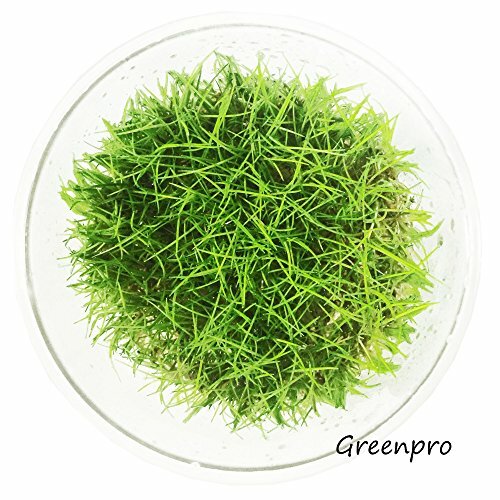 To ensure successful growth of Dwarf hairgrass make tank water temperature about 23°С. The plant easily stands temperature decrease up to 20°С. Water pH should be within 6-7 and water hardness up to 15 dGH. To grow healthily the plant requires nutritious substrate, intense lighting, CO2 supply (10-15 mg/l) and water circulation in the tank. Once these requirements are met Dwarf hairgrass grows thickly over the whole surface of the tank substrate penetrating even into shadowed areas. Depth of the substrate layer should be not less than 4 cm thick with upper layer grain size not less than 3 mm, since the plant can’t stick to the substrate with larger grains and it is hard for it to strike roots into such a substrate. Thin stems of Dwarf hairgrass can’t stand algae fouling or any other biological fouling. To make sure that the plant grows successfully you should maintain the tank clean by means of using a high quality filter and regular partial water renew. LIVE AQUARIUM PLANT : Dwarf hair grass, great carpet plants. EASY AND LOW MAINTENANCE REQUIRED : NO need any special maintenance, Perfect for any size of aquarium tank. From time to time you should siphonage the tank bottom surface under the plant bushes, since it becomes silty right there. To prevent appearance of algae fouling you have to select right lamps (with proper radiation pattern) as well as daylight duration, which shouldn’t exceed 12 hours. At first the plant grows very slowly. For the first three weeks Dwarf hairgrass gets adapted to new water medium, strikes roots and grows new shoots. The old leaves of the plant gradually rot off. You should occasionally clean it from them by moving the plant a little, so that the leaves float to the water surface. This has to be done very carefully not to pull out the plant from the bottom substrate. To maintain decorative appearance of the lawn you should trim it regularly up to 2.5 cm (1 inch) tall, such an approach promotes appearance of new shoots and makes the carpet thicker. As for areas behind stones or in shadowed ones, to create heterogeneous natural look of the lawn you shouldn’t trim it.